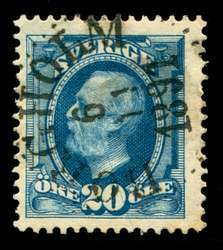 56 [1891 5 öre Oscar] NH F-VF with Inverted Watermark. One of the Yellow Green colors. 60 Type I, Facit #56I [1891 20 öre Oscar watermarked; no horizontal engraving lines behind ear] Used with Superb centering and a F-VF 22 September 1891 HÖÖR (changed to HÖR in 1911) pre-November cancel that confirms that this must be a Type I. The Ultramarine color is distinct, but exists for both types -- Type I does NOT have horizontal shading lines on the back of the head behind the ear (Type II does). This stamp is scarce with such nice centering and is rarely seen thus AND with a confirming-date postmark. Certainly scarcer than 1 in 1000 examples. 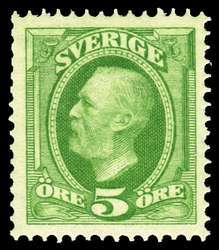 60 Type I, Facit #56I [1891 20 öre Oscar watermarked; no horizontal engraving lines behind ear] Used with Superb centering and a Fine 9 January 1892 (T)ORSÅKER cancel (somewhat scarcer). The Ultramarine color is distinct, but exists for both types -- Type I does NOT have horizontal shading lines on the back of the head behind the ear (Type II does). This stamp is scarce with such nice centering. 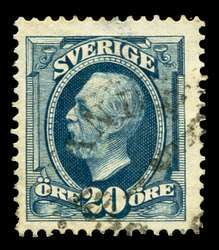 60 Type I, Facit #56I [1891 20 öre Oscar watermarked; no horizontal engraving lines behind ear] Used with Superb centering and a F-VF 9 January 1892 TORSÅKER cancel (somewhat scarcer). The Ultramarine color is distinct, but exists for both types -- Type I does NOT have horizontal shading lines on the back of the head behind the ear (Type II does). This stamp is scarce with such nice centering. 60 Type I, Facit #56I [1891 20 öre Oscar watermarked; no horizontal engraving lines behind ear] Used with VF centering and an 8 August 1891 pre-November cancel that confirms that this must be a Type I. The Ultramarine color is distinct, but exists for both types -- Type I does NOT have horizontal shading lines on the back of the head behind the ear (Type II does). This stamp is unusual with a clear confirming-date postmark. 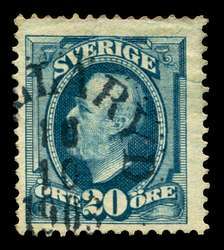 60 Type I, Facit #56I [1891 20 öre Oscar watermarked; no horizontal engraving lines behind ear] Used with F-VF centering and a Fine 3 July 1891 KARLSTA(D) pre-November cancel that confirms that this must be a Type I. The Ultramarine color is distinct, but exists for both types -- Type I does NOT have horizontal shading lines on the back of the head behind the ear (Type II does). This stamp is unusual with a clear confirming-date postmark. 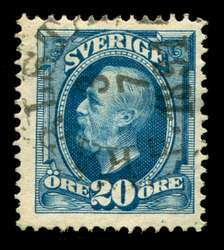 60 Type I, Facit #56I [1891 20 öre Oscar watermarked; no horizontal engraving lines behind ear] Used with F-VF+ centering and a F-VF+ (complete, but sideways) 6 November 1891 BORGHOLM cancel. The Ultramarine color is distinct, but exists for both types -- Type I does NOT have horizontal shading lines on the back of the head behind the ear (Type II does). The catalogs indicate that Type II came into use sometime in November and do not indicate a specific date, thus this 6 November date could perhaps be confirming of Type I. A very attractive example. 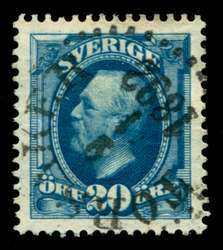 60 Type II SLATE BLUE, Facit #56IIc [1891 20 öre Oscar watermarked] Used F-VF with light cancellation. 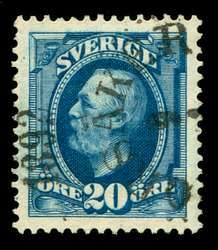 While the Slate Blue printings were in use for a couple years (1894-1896), most just look dull blue and do not stand out. However, a few -- very scarce -- examples, such as this one, have such distinct color that they really jump off the album page! 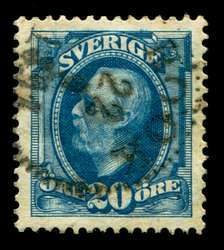 60 Type II Inverted Watermark Facit #56IIdvm1 [1891 20 öre Oscar watermarked] Dull Blue, Used Fine with neat 10 October 190(5?) cancellation "...LLARYD" (Gällaryd, Hallaryd, Mallaryd; all are quite unusual). Attractive. 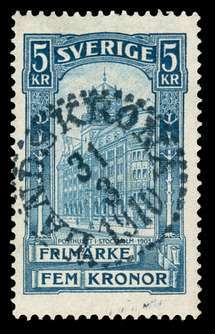 66 [1903 5 kr Post Office] Used VF+ with nicely centered LANDSKRONA 31 March 1910 postmark. 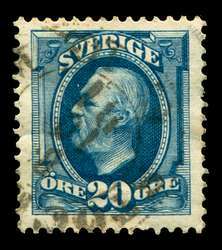 Wonderful example; this stamp is scarce with nice cancels.